The Rev. 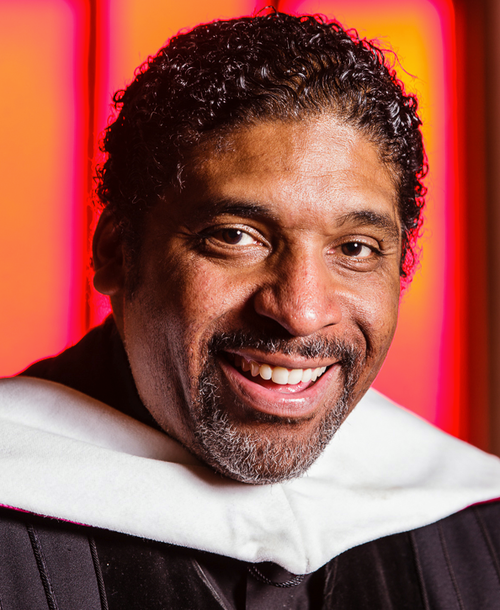 Dr. William J. Barber II is the President & Sr. Lecturer of Repairers of the Breach, Co-Chair of the Poor People’s Campaign: A National Call For Moral Revival; Bishop with the College of Affirming Bishops and Faith Leaders; Pastor of Greenleaf Christian Church, Disciples of Christ in Goldsboro, North Carolina, and the author of three books: Revive Us Again: Vision and Action in Moral Organizing; The Third Reconstruction: Moral Mondays, Fusion Politics, and The Rise of a New Justice Movement; and Forward Together: A Moral Message For The Nation. Rev. Dr. Barber served as president of the North Carolina NAACP, the largest state conference in the South, from 2006 – 2017 and currently sits on the National NAACP Board of Directors. A former Mel King Fellow at MIT, he is currently Visiting Professor of Public Theology and Activism at Union Theological Seminary and is a Senior Fellow at Auburn Seminary. Rev. Dr. Barber is regularly featured in media outlets such as MSNBC, CNN, New York Times, Washington Post, and The Nation Magazine, among others. He is the 2015 recipient of the Puffin Award and the Franklin D. Roosevelt Four Freedoms Award.